Honey, I shrunk the games schedule! The last month of the NBA season is rapidly becoming like Week 17 in the NFL, except it’s maybe worse in terms of the volatility in the game schedule. There are only nine teams playing four games this week, after we had 16 last week plus the Warriors playing five games — though that wasn’t fully the case, with Steph Curry getting a rest day Saturday against the Mavericks and Kevin Durant playing as if he was getting a rest day too. But with so many teams are now starting to shut down players for the season and giving extra days with no notice, this last month has descended into farce. Before we get into the particulars of Operation Shutdown (let’s pour one out for Derek Bell and his boat), let’s list out each team’s number of games. … with the news coming out of Minnesota that Jeff Teague, Derrick Rose and Robert Covington are all out for the last few weeks of the season. The Timberwolves have been eliminated from the playoff race, as the top eight teams in the West are almost settled, with only Sacramento hanging around officially, though even then the Kings are 5.5 games out of the last spot. 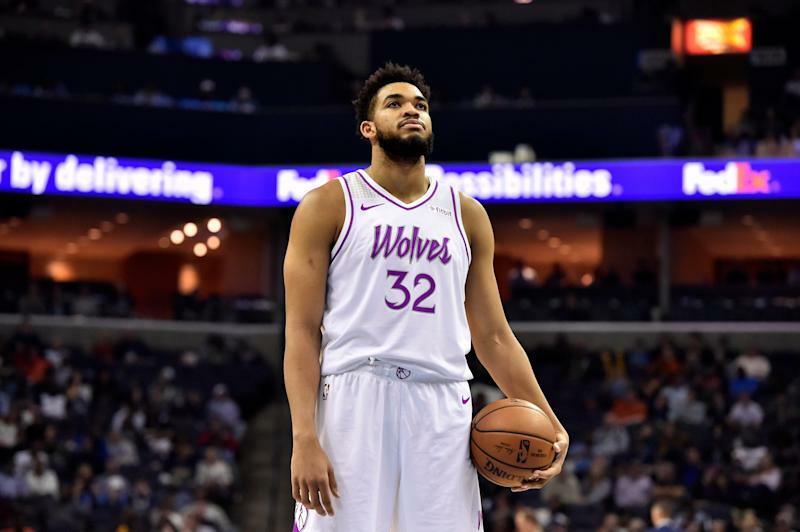 All the injuries and the playoff elimination haven’t made Karl-Anthony Towns skip a beat; he’s still tearing it up. But the two players that have jumped up in minutes and production for them have been Tyus Jones and Josh Okogie. Jones had a nice stretch earlier when other point guards were hurt before suffering an injury of his own. But he’s now had back-to-back games with 30+ Yahoo Fantasy points and three of his last five. Okogie, a rookie out of Georgia Tech, is more of a shooting guard, but he’s providing help for you on the boards and a little bit in steals and blocks. Three of his last four games have eclipsed 30 Yahoo points. … with Kelly Oubre’s season-ending thumb injury, and then matters got worse on Saturday when Josh Jackson had to sit out with an ankle injury. Mikal Bridges is the immediate beneficiary to those injuries, though Troy Daniels and Dragan Bender are also getting more minutes than usual. Bridges is the only one of three getting the ball enough to make a consistent difference, especially in a three-game week which might be your championship week, as it is for me (hopefully — semi-final pending). … losing their last four on a brutal West Coast swing. It doesn’t get any easier for them now that they’re off that swing. They get a home game against the Nuggets on Sunday, before hitting the road again next week with games at Oklahoma City and Boston, before finally getting home again on Saturday against the Magic, who are still alive for a playoff spot. It’s worth noting that nobody played 30 or more minutes in Thursday’s loss to the Warriors, though that might have been a function of the end of the road trip and a blowout loss. Darren Collison has missed the last two games with a quad injury and was questionable for Sunday as well. Tyreke Evans has played more and contributed more as a result. But given the difficulty of the schedule, the fact that the Pacers are locked into the playoffs and pretty close to being no worse than a five-seed, it might be a good week to fade all Pacers this week. … and that might be for the best while we try to figure out coach David Fizdale’s playing time rotations. DeAndre Jordan (“You’re still here?”) had a big day Sunday against the Clippers, with 20 points, 13 rebounds, four assists, two blocks and two steals, but prior to that he had three consecutive games with 20 Yahoo points or fewer. Emmanuel Mudiay has been the Knicks’ most consistent player lately, but even he has had two stinkers in the last two weeks. Abandon all hope ye who enter here. With all of those rest games and injuries out there, let’s look at the four-game teams and see if there’s any surprising value we can find. … winning six in a row heading into Sunday’s game against the Pacers. Nikola Jokic obviously brings it every night, but then they have about six different players that can score 30 Yahoo points in a given night. Paul Millsap is your most reliable option behind Jokic, and now that he’s healthy he’s averaging 35 Yahoo points per game over his last 15 games. Jamal Murray and Will Barton remain reliable plays, averaging 30 and 25 respectively — good enough to use in a four-game week. Mason Plumlee is there for you in a pinch if you need help at center, too. … an ankle impingement Sunday against the Knicks and could be out for several days. As a result, I think that both Danilo Gallinari and Lou Williams should be good plays. Both are on a roll right now anyhow, averaging 35 Yahoo points per game over their last 15. Shai Gilgeous-Alexander logged 38 minutes on Sunday as a result of Shamet’s injury, though the production didn’t quite follow with those extra minutes. … for the season, and Josh Hart is out for the short-term, but the first thing we look for in Lakers games is whether LeBron James is getting a rest day. If not, everything runs through him and he continues to pile up big numbers. If he’s out, someone else has to step up, and who that is that steps up often rotates. We’ve seen big games from Kyle Kuzma, Rajon Rondo and Kentavious Caldwell-Pope in those instances. However, the most consistent non-LeBron Laker lately has been JaVale McGee, who has four games out of his last six with more than 25 Yahoo points, including a whopping 68 Friday against the Nets. He might also have the added bonus of being available in case your starting center is DeAndre Jordan. … and Jonas Valanciunas, and both should be starts for you this week, even with the risk of Conley sitting out one game next weekend. But keep an eye out for Delon Wright, who has put together a few big games in the last month after arriving from the Raptors in the Marc Gasol trade. When Conley sat out on Friday, Wright logged 39 minutes and responded with a 12-point, 7-rebound, 8-assist game. With Conley back Saturday he played just 27 minutes, but still managed to produce a 28.8 Yahoo point game against the Timberwolves. … Winners of four straight, they have four games this week, and a number of players on a roll. Get Nikola Vucevic and Aaron Gordon back in there if you sat them during their two-game week this past week, and you should be able to turn to D.J. Augustin, Evan Fournier and even Terrence Ross as well. … for Portland, nobody else has stepped up to be a reliable contributor next to Damian Lillard and Jusuf Nurkic. Maurice Harkless is as close as we get with him scoring over 22+ Yahoo points over the last three games, and maybe that’s enough to pay the bills for you if you’re short at forward. But with a max of 35 points over his last 15 games, he’s had precious little upside and that doesn’t project to change. … and once it’s official you might see them adjust Marvin Bagley’s playing time down given his injuries this season. Nemanja Bjelica has stepped up his game recently, including a big 44.9 Yahoo point game Saturday against the Suns. He could continue to get more of a run over the last couple of weeks. … out of the Eastern Conference playoff race, having lost four in a row. Trevor Ariza has missed the last two games after injuring his groin Wednesday night, and the Wizards very easily could shut him down the rest of the way. Bobby Portis has been the one to step up his production with Ariza out, though somewhat surprisingly Jabari Parker’s line has gone down with Ariza out. Still, I like both of them this week. The Wizards play four games on the road this week, starting off with nice spots against the Lakers and Suns, before the defensive opposition steps up in the form of Utah and Denver. Before you set your lineups, make sure to check out our breaking news and our lineups page. We can’t promise to find all the planned rest days in advance, but at least we can identify those immediately in front of us to begin the week. Now, go out there and win a championship!